I always like to scout areas that I am trying to ski the upcoming season. Every summer I try to use hiking and biking journeys to scout terrain for skiing as well. Now that I am getting back into game shape I have doubled up on the scouting to catch up as well. Murphy and I have been doing a lot of line hunting and route finding excursions in Baer Creek Canyon and Farmington Canyon. There is a lot of great skiing up there. The access is difficult, but the rewards are plentiful. Mostly snowmobile traffic, which can go either way in my opinion. I am all for it, because of access and rescue. There are very few skiers up in these zones though. Very few. ^A little while ago, Christine, Murphy and I did a route finding and orientation scout into Malan's Basin in Ogden. I have skied the upper sections of this area many times and I was looking for a route for Ogden City skinning access. I have done some ski work for the landowner in the past and the terrain is really diverse. The lower section is all North/Northwest pine tree glades. There are two nice rocky bowls descending from the ridge that also range mostly North/Northwest. 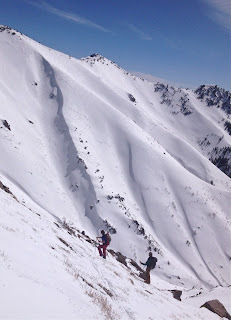 There really is a lot of skiing in the zone that is just one canyon off of the Ogden range. The backcountry skiing off the Ogden range is vast, I mean vast. The terrain is deceptive and dangerous, which is a good quality for locals to keep their gems hidden and feared. However, when one spends the proper time to become more familiar with the range the world begins to open up vast as the Great Salt Lake view. ^ This is just a little peak at a new section I found in one of the Ogden ranges little gems. I can't tell you everything. Some locals would have me killed for what I've said already. However, I am sure they would agree in offering up this disclaimer on the areas in the range. This backcountry terrain has claimed many lives and egos in the past, and probably will in the future. The area is becoming more popular, and with traffic comes crash and burns. I have had plenty of my own in this range, plenty. More then I ever bargained for, which has motivated me to pursue focused avalanche training and guidance. As well as, rescue training, route finding, and the myriad of other skills one acquires in ten years of pushing the boundaries. ^The sunset on our way back down from Malan's Peak was a plentiful reward for our hard work in our ascent. Christine and Murphy are soaking up the magic vibes. We had a long way to go to get out, but the scene was so good that we couldn't resist taking some time to watch this big finish. ^It was a steep hike and Murphy was getting pretty gassed. Usually we would just stop and take a break, but with the dark setting in we had to hurry out. From time to time on scouting endeavors we often require some off trail travel. Murphy and I can get into hairy situations that require some minor climbing and gnarly scrambling. So, as a result, we have developed a handy little piggy back trick that we use in those situations. In this case we employed the skill to give her a break while Christine and I pushed on to get out before it got too late. It was pretty hilarious running down a trail with the dog on my back. She was getting so chill back there that she was barely even hanging on anymore. Also, I was getting more then enough strength training running down hill with an extra 60 lbs. on my back. That is when I decided she must be rested enough to finish the rest on her own.